Description This archive contains my standard pack of 49 koloboks BIG series and combinations to them for the Jimm. My sets use these koloboks and combinations by default. 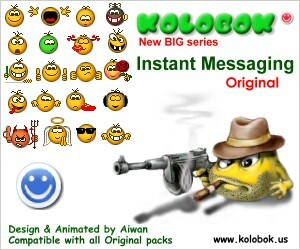 Installing this pack allow you to get and to send koloboks to everyone who use QIP or ICQ, or any other client with the same pack. Render time: 0.0883 sec, 0.0097 of that for queries. DB queries: 20.